This is a great choice for any mother in your life, whether it's your own mom, a mother-in-law, a grandmother, a daughter, or a friend. 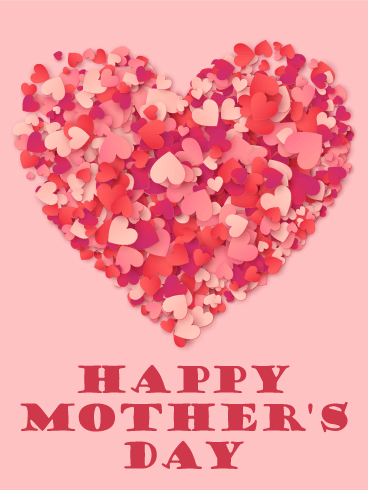 The photograph of heart-shaped confetti is fun, but the lack of specificity makes this Mother's Day card suitable for all mothers, not just your own. This bright, exciting Mother's Day card is sure to make any mom smile! A ring of rich, colorful flowers holds your best wishes inside for a wonderful Mother's Day! This sweet and delightful card will remind her that you're thinking of her today, and hoping she enjoys every minute of her celebration. 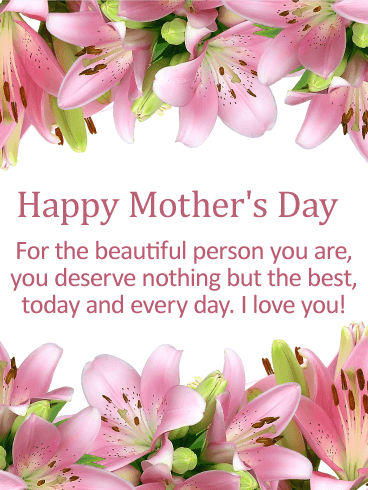 Whether it's for your own mom, or another special woman in your life who encourages and inspires you, she is sure to feel special knowing you took the time to remember her. Full of color and personality, just like the special mom in your life, this Mother's Day card will fill her with joy and happiness! A rainbow of sweet daisies decorates the top and bottom, beautifully framing the heartfelt message inside, which lets her know how much of an inspiration she is to everyone. Both kind and caring to the people around her, she deserves to feel loved and appreciated every day, but especially today. This whimsical Mother's Day card, with a trail of colorful butterflies, is a beautiful way to tell your mom that she deserves all the love in the world, simply because of all the happiness and joy she brings into your life each and every day. Whether you are there to celebrate with her, or sending your best wishes from far away, this is your opportunity to let her know she's on your mind and in your heart. 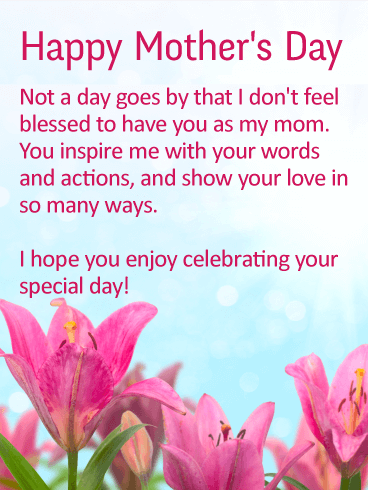 This Mother's Day card is a stellar way to show your mom how much she means to you. 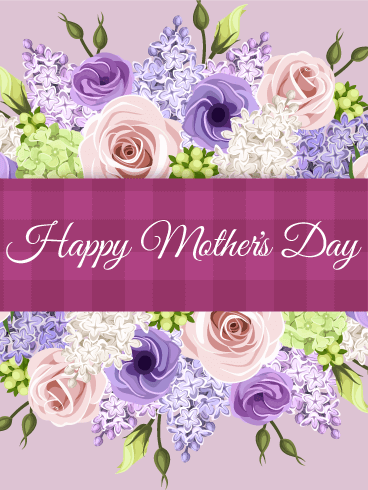 The soft colors add a sense of elegance to the Mother's Day card, while the word "blossom" pulls together the sentiment and the background picture without sounding too corny and over-the-top. 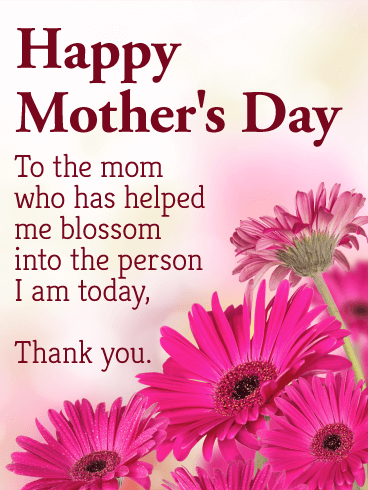 It's a great choice for any mom who has made a positive impact on your life. Swirls of flowers, hearts and butterflies in rich purple bring a whimsical touch to this Mother's Day card! What really makes this such a special greeting is the message. "If I could describe what a perfect mother should be, I would simply describe you, mom." What a wonderful expression of how you feel about her, and what an impact has had on your life. 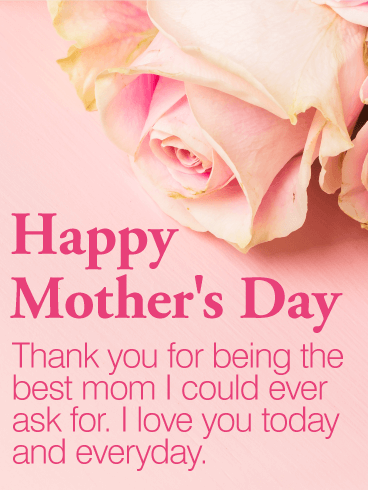 Every mom deserves to feel this loved and appreciated, today and every day. 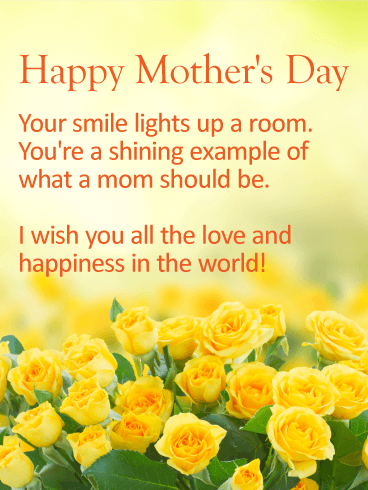 Filled with warm golden flowers against a bright yellow background, this delightful Mother's Day card is a wonderful way to wish your mom a very Happy Mother's Day! She is someone who always shines in your eyes, a beautiful example of what every mom should be. So when it comes time to celebrate her, let these touching words help express exactly what you're feeling inside about the woman who has encouraged, inspired and shaped you into the person you are today. 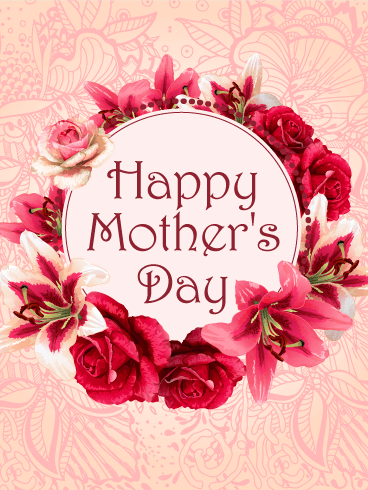 A beautiful bouquet of flowers adds a lovely and delightful touch to this Mother's Day card for any special mom in your life! The soothing purple background and elegant scripted font add to its charm. 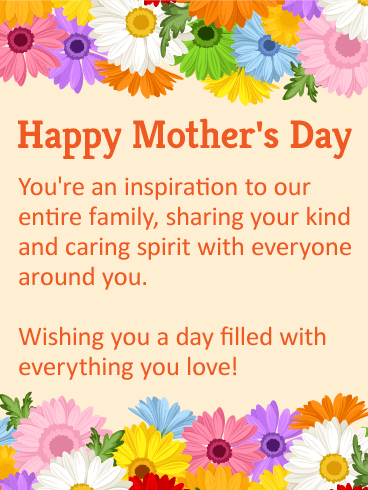 Whether it's a sister, an aunt, a friend or your own mom, she's sure to be touched knowing you remembered her on this special day set aside to celebrate amazing moms everywhere! 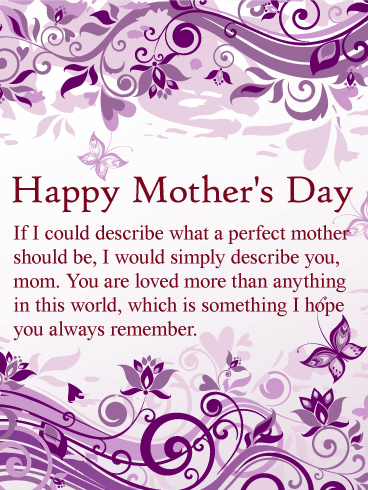 How do you wish a mom as amazing as yours a Happy Mother's Day? With the sweet and sentimental words found in this lovely Mother's Day card! A garden of colorful flowers surrounds this touching message, which is a beautiful expression of how much it means to have her as your mom. She has been there from the very beginning, showing you what it means to love with all your heart, and has continued to share so many life lessons with you along the way. No matter how far apart you are in miles, let her know you're thinking of her, today and every day. 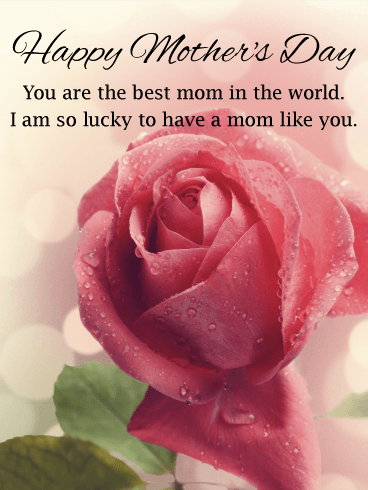 If you can't afford roses this Mother's Day, but still want to offer the sentiment of giving your mother a rose, this Mother's Day card is a great option. It lets your mother know that you care, and the artwork is absolutely breathtaking. With its stunning background and heartfelt warmth, this Mother's Day card is sure to be a home run this Mother's Day! For a mom that has done so much for you, here's your chance to let her know how much you love and appreciate her. This beautiful Mother's Day card features a sea of rich pink flowers against a clear blue sky-the perfect backdrop to wish her a day filled with warm moments and treasured memories. The touching words come straight from your heart to touch hers, leaving mom feeling incredibly special.